Babátúndé Rájí Fáṣọlá (ojoibi 28 June, 1963) je agbejoro ati oloselu ara Naijiria. Lati 2007 ohun ni Gomina Ipinle Eko. 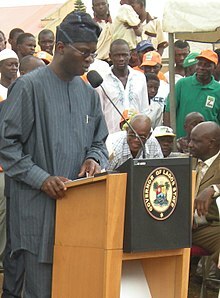 ↑ "HIS EXCELLENCY, BABATUNDE RAJI FASHOLA (SAN), GOVERNOR OF LAGOS STATE, NIGERIA". Commonwealth Business Council. Retrieved 2010-02-14. This is a list of administrators and governors of Lagos State. Lagos State was formed in 1967-05-27 from Colony province and Lagos federal territory.